Head injuries are a common occurrence in Portland auto accidents, but they shouldn’t be taken lightly. A traumatic brain injury (TBI) is more than just a bump on the head. It causes your brain to slosh against the inside of your skull. Even if you seem fine immediately after a crash, a TBI can cause damage to the brain tissue and blood vessels. Unlike most injuries, many brain injury victims never make a full recovery. Once damaged, some brain tissue and neurons will never regenerate, resulting in permanent complications. Coup-contrecoup brain injury: When a serious accident occurs, the brain hits the inner lining of the skull on the opposite side of impact. Concussions: In comparison to coup-contrecoup brain injuries, concussions are relatively mild – but there is no such thing as a truly minor brain injury. If left untreated, concussions can result in lifelong complications. Brain contusion: When a concussion or other type of brain injury occurs, it may accompany bleeding under the skin. In severe cases, surgery may be required to remove a brain contusion. Diffuse axonal injury: This type of TBI happens the same way as a concussion, but the injury is often much worse. Second impact syndrome: This occurs when a second TBI is sustained before the first has healed. The damage can be far worse, even life-threatening. 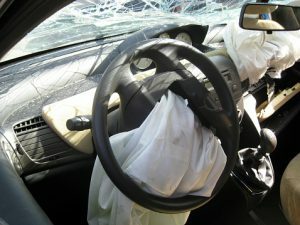 Penetrating injury: Debris that is propelled during a crash, or parts of your own vehicle, can cause a penetrating injury. In this type of TBI, severe bleeding can occur. TBIs are no laughing matter. If you have sustained one in an auto accident caused by someone else’s negligence, you are urged to seek immediate medical attention. Even if you feel fine, your TBI can worsen without treatment. Additionally, you may be faced with lifelong brain damage that can hinder your ability to engage in everyday activities. Even if you make a full recovery, you may experience a lifetime of mental and emotional trauma. Treatment for a TBI can be expensive. If you are unable to attend work and make ends meet, the aftermath of a single auto accident can take a devastating toll on your life. If you were injured in a crash, you need an experienced Portland auto accident attorney on your side who can help make things right. Contact us today to schedule a free case evaluation. This entry was posted on Friday, January 11th, 2019 at 3:10 pm and is filed under Car Accidents. You can follow any responses to this entry through the RSS 2.0 feed. You can leave a response, or trackback from your own site.